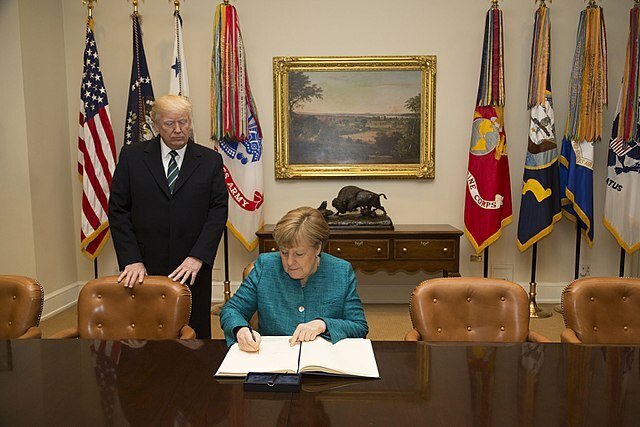 Chancellor Angela Merkel visited Washington on 27 April for only the second time since Donald Trump became president. It was described as a ‘working visit’ and lasted just 22 hours, including about two and a half hours with the president. The sparsity of these visits (they’ve also met twice in Europe, including at the 2017 G20 meeting in Hamburg) is partly explained by the paralysis in Germany as a result of the 171 days it took to form a government after the September 2017 elections. But there’s no getting around the facts that the two leaders have little personal chemistry, their world views are poles apart and there are major policy differences between them. Chancellor Merkel’s first visit to Washington in March 2017 was overshadowed by President Trump’s apparent refusal—now described by the President as a ‘misunderstanding’—to shake hands with her. Then, after the G7 summit in May 2017 in Sicily, at which the President’s views on key issues such as climate change appeared uniformly run counter to European views, the Chancellor made her landmark public comment to the effect that Europe was now on its own and could no longer rely on others. The subsequent media speculation that Chancellor Merkel might become the leader of the West, given disillusionment with the US President, wouldn’t have helped the atmospherics. And it seems as though the President sees Germany as a particularly egregious example of all the wrongs he wants to right. He’s accused Germany, among others, of unfair trading practices and intends to impose tariffs on steel and aluminium products from EU countries—including Germany—from today. When the Germans and other Europeans responded with threats of counter-tariffs, Trump replied by singling out German car brands for particular attention. He has constantly urged other NATO members to lift substantially their contribution to global security and bear more of the burden for this, especially by meeting NATO’s target of members spending 2% of GDP on defence by 2024. Germany has been particularly recalcitrant in this regard: its defence expenditure is currently only 1.2% of GDP. President Trump is justified in some—but not all—of his criticism. Other EU members have been highly critical of Germany for not investing more of its huge trade surplus within the union. And Germany’s poor showing on defence—although partially explained by history—is not at all commensurate with its size and importance globally and within Europe. There are many within Germany who also argue very strongly for it to accept more responsibility internationally. So expectations weren’t high for the Chancellor’s visit to Washington last week. Despite a determined attempt by both leaders to show the assembled media that they got along—kisses, any number of handshakes, smiles, public congratulations from the President on the Chancellor’s re-election—Angela Merkel got precisely nowhere. That despite no doubt putting her arguments on all the important issues as directly and cogently as she can (and she’s a formidable and powerful advocate). On trade, she was forced simply to say, somewhat lamely, that ‘the President would decide’ on whether to impose steel and aluminium tariffs, a decision that has now been delayed until 1 June. On defence, the Chancellor had to listen to President Trump yet again publicly calling on the Europeans to do far more and accept more of the burden. Her promise, in turn, that Germany would do its bit rang very hollow. It’s far from doing that and has little chance of meeting the NATO target by 2024. Even though the chancellor told the president that this would increase next year to 1.3%, the NATO target isn’t even mentioned in Germany’s grand coalition government (GroKo) agreement between Merkel’s Christian Democrat/Christian Social Union (CDU/CSU) and the Social Democrats (SPD). On Iran, the President seemed still inclined to withdraw from the nuclear deal, although he did acknowledge that building on the existing deal (as proposed by President Emmanuel Macron) was also a possibility. Inevitably, given the coincidence of timing, Chancellor Merkel’s visit is being contrasted with the visit to Washington a couple of days earlier by President Macron. There’s no question but that Mr Trump finds Macron a more congenial partner, and this was reflected in the high profile and pomp of President Macron’s program. Emmanuel Macron and Angela Merkel have approached the trans-Atlantic relationship differently. Mr Macron has tried to get personally close to the president, has hosted him in Paris (with all the trimmings), has announced a sharp increase in French defence expenditure and has been a strong partner for the US, including through French participation in the recent missile strikes in Syria. That has opened the door for President Macron to put French (and European) views openly and clearly, including to Congress, something Angela Merkel wasn’t able to do. The Chancellor’s approach has been more direct and policy-oriented, outlining Germany’s position and not hiding differences. For example, she ruled out, in advance, participating in the Syria strikes and has stoutly defended both the Paris climate change accord and the Iran nuclear deal. It is, however, too much to contrast Macron’s three-day state visit with Merkel’s 22‑hour working visit. That reflects their differing styles, rather than being a deliberate US snub. And their visits to Washington were carefully coordinated: Mr Macron and Frau Merkel had spoken at length on 19 April, when President Macron visited Berlin, and no doubt were in close touch at the time of their respective visits. And President Macron’s approach didn’t result in anything more on trade, Iran or climate change than Chancellor Merkel’s. But it seems clear that, at least for now, Macron is filling a vacuum where Germany used to be. Partly reflecting its domestic political circumstances, Germany has been absent for too long on the big issues for Europe and the world. It’s high time that it resumed a leadership role, especially with such a willing and energetic partner as President Macron’s France. And there’s no doubt that Macron is staking a claim for European leadership and for being the preferred partner of the US in Europe post-Brexit. He recently also outlined a vision— not necessarily shared by Angela Merkel—for Europe, and defended democracy and Western values, in a significant speech to the European Parliament. Let’s hope the Chancellor soon rejoins him. It would be a pity if the Washington Post proved right with its over-the-top comment on 27 April that German ‘hesitation’ risks it becoming ‘Europe’s weakest link ’. David Ritchie served as Australia’s ambassador to Germany from 2014 to 2016. Image courtesy The White House via Wikimedia Commons.